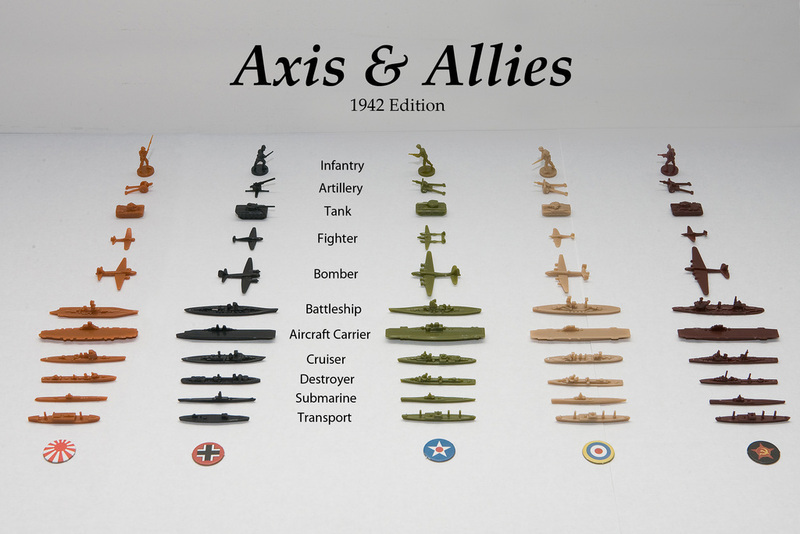 The playing pieces from the current 1942 edition of Axis and Allies. For more details check out the link below. As is my want I briefly mentioned in my last blog post about the potential solution I may have for 20th century games using my block armies. It is rather unconventional but then probably no more so than using blocks with 3D terrain is! There is no doubt that our friends across the pond are very well served in respect of spare parts for board games. From counters and variant counters, extra maps, dice, play sheets and rules the chances are you will be able to find someone that can supply spares if required. The same is also true of playing pieces - both for the 'official' versions and any of any of the myriad variants that a popular game will inevitably spawn. Axis and Allies is lightweight WW2 grand strategy boardgame originally produced by MB Games and more recently under the Avalon Hill label as part of Wizards of the Coast (who in turn are owned by Hasbro). The game typically features a substantial quantity of fairly modestly detailed miniatures depicting the playing units. Infantry aside there are vehicles including tanks, various artillery types (usually field and AA). a selection of naval pieces and aircraft. These are modelled to look nationality specific and are fairly generic looking. From a scale perspective they are not consistent and are made from soft plastic. More detailed models that are far more readily recognisable are available from Historical Boardgaming and are 3D printed in a harder plastic. So here is my idea. I will try and pick up a cheap second hand set of the game - I doubt very much if I will ever play it as is - and will use the miniatures to support the blocks. There are a number of examples of painted pieces in use on the net and they look very effective. This means I will wargame using a combination of blocks and miniatures. The ship pieces are very intriguing and I have something in mind for them as well - especially when one makes use of some of the variant pieces that are available. Lets be honest, when fighting a 20th century naval game one does not need to use models at all. In fact, using models rather fudges the issue as they are hugely over scale for the average tabletop. We use models because we can and because they look good and even I will admit to enjoying painting them (as long as they are plain grey that is....). 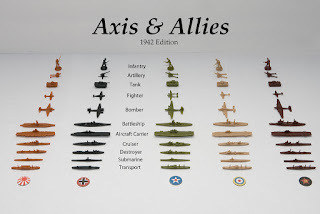 The ship models from Axis and Allies (NOT their collectible naval game but the one above) tick a number of boxes for me as they are functional game pieces that can be used in a relatively generic way. I should point out that I am fast becoming a generic naval gamer rather than a rivet counter - simply because stressing about minute differences between ship types is a fairly pointless exercise. Major differences should be reflected for sure but this can be tackled easily enough and without the angst-ridden soul-searching I have usually undertaken. Visually there are certain design features that serve to reflect the national identity of a warship and as long as these are present on the model in some way that should suffice for gaming purposes. Virtually every set of naval rules I have used makes use of a ship record card for damage and performance so in reality (and in my opinion) this is the main focus of how well a ship is (or isn't doing) - not the model on the table. I will post in full about this last heretical point in due course. Don't see anything heretical here, David. All makes a whole deal of sense to me. One Idea I have had - and very occasionally posted on - has been to use figures and vehicles for map based games, more like Kriegspiel than the 'operations level' war games I've been playing recently. For a late 19th Century version I was using the figures and items from the 'Age of Empires' game. There an army corps might comprise 5 infantry figures, 2 cavalry and a gun; a cavalry corps 5 cavalry and a gun. An army comprises 3 army corps and 1 cavalry corps. I suppose I have reached the stage where playing the game with what I have to hand rather than a whole lot to expense is becoming more attractive and certainly the style of game I want to fight dovetails in with this. I will have a trawl back through your blog and see what you have done in this regard. Well no one said "Burn the witch"